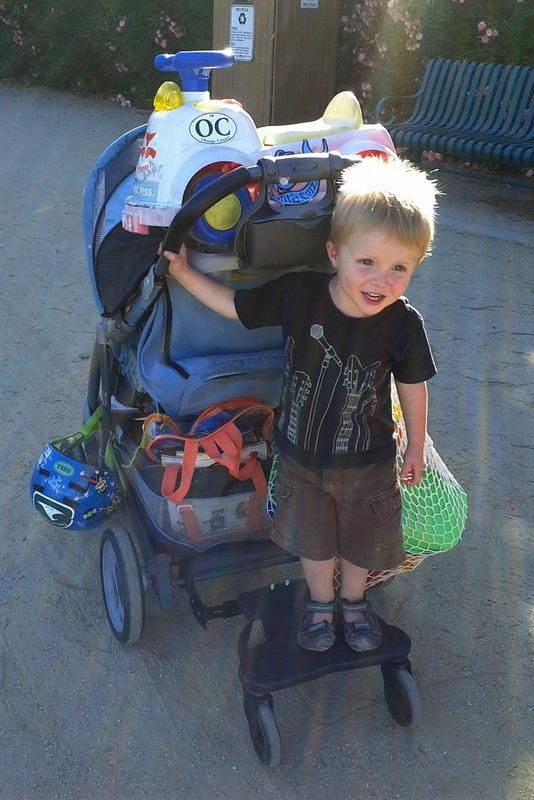 Having three children has created a bit of a conundrum in the stroller department. We have a Joovy Caboose, I bought off of craigslist, that holds a sitting child and one standing up. It didn't come with the car seat attachment so there is no way to add Piper into the mix. I decided to buy a Buggy Board from Amazon.com so that Reade can ride on the back of our Graco stroller and Piper's car seat can snap into the front. That means Blake is on his own, but I trust him enough to walk attached to my Mommy Hook. This picture was taken on the way home from the park this afternoon. I look like a homeless person who threw two kids into the mix. Why on God's green Earth do we need that much stuff just to go to the park? There wasn't even a diaper bag in the mix!